Mary Velthoen was born in 1966 in Grand Rapids, Michigan (USA) from Dutch parents. Her father is a pastor. From her early age her mother read aloud stories from the Bible at meal times. These stories have been formative for her life and faith and inspiring for part of her oeuvre. In 1973 the Velthoen family moved back to the Netherlands. At the time Mary was almost 8 years of age and learned to speak Dutch and Frisian. Already during her childhood drawing was a great passion. At high school crafts were one of her examination subjects. After high school she followed a formative year at an Evangelical College, where she met her husband. In Groningen she studied crafts and drawing at a teachers college and continued her art education at the Minerva art academy in Groningen. There she trained in painting and graphic art, Jan van Loon and Wim Jonkman being two of her teachers. At this moment May Velthoen works in Groningen as a teacher in drawing and art history at a private senior high school. Regularly she participates in group exhibitions in galleries, e.g. with the artists society De Ploeg. Tree of Life with red background, oil on panel, gouged surface, 120 x 70 cm. Tree of life with lovers, acrylic on panel, gouged surface, 150 x 60 cm. Her style is figurative and expressive with recognizable themes. 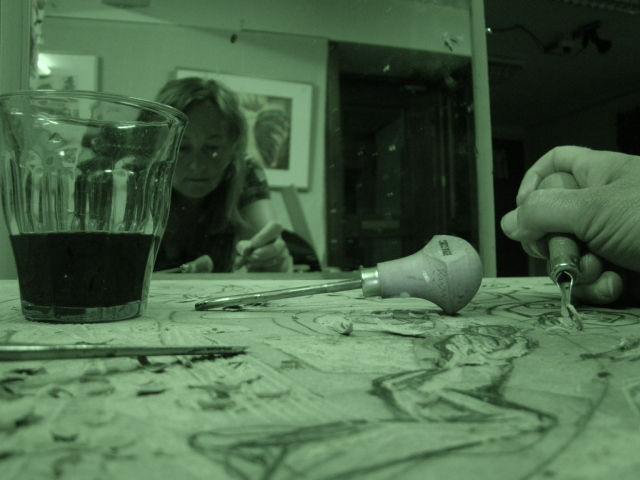 At this moment she creates work about trees, painting symbolically and in a loose style from nature around her. 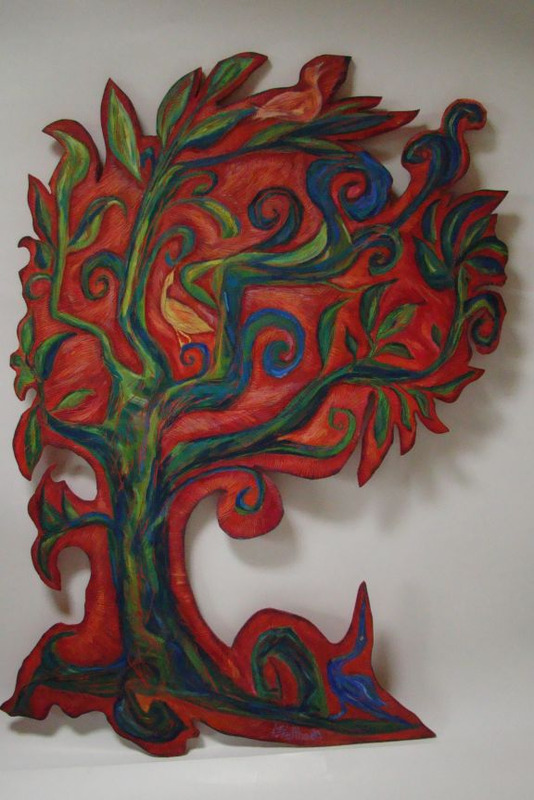 The tree of life she portrays in a free and graphic style in reliefs of wood. She gouges the surface of the wood and then paints it with oil. These objects are inspired by traditions in all cultures as to the theme of the tree of life. Velthoen finds her inspiration especially in early Christian medieval art, folk art, children’s drawings and Bible texts. Mary works in two styles: the contour sawn wooden trees of life, and paintings from observation: dancing trees in expressive colourful paintings of oil on canvas. She finds inspiration for this in the landscape of Groningen where she lives. On the website of Mary Velthoen one can view several series of contour sawn paintings, swimmers, trees and plants.